Black and white image of a man leaning on the externally mounted spare tire of a delivery van. The man wears dark pants, a belt, and a checked shirt. He has short hair and glasses. In the background is a two-story building with a covered porch and what appears to be an open garage door. 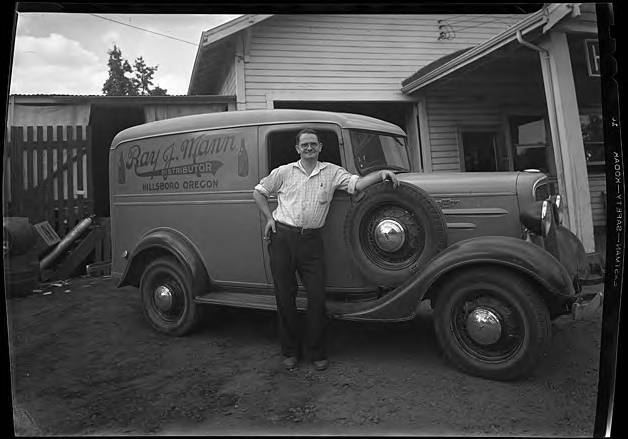 Printed on the upper side panel of the van is printed 'Ray J. Mann, Distributor. Hillsboro, Oregon.' Two liquor bottles frame the lettering. This image was part of the Herbert McMullen bequest. McMullen was a local photographer who also collected other images of daily life in the area.